Microsoft continues to bleed mobile market share with Windows 10 Mobile, so why are some enterprise developers betting big on the platform's eventual success in the corporate world. Microsoft's Windows 10 Mobile platform, formerly known simply as Windows Mobile, has less than 3 percent mobile OS market share, and it is so far from the center of Microsoft's focus that it was barely even mentioned at last month's Build developer conference in San Francisco. The company also recently released iOS versions of some of its most popular apps, including Office, that were greatly improved, taking away one of Windows' traditional advantages over rival platforms. So why would a savvy software veteran like Alfredo Patron devote precious corporate resources to port enterprise apps to Windows 10 Mobile? "We're making a bet," says Patron, the vice president of business development for TeamViewer, a company that develops remote access software for enterprises. Patron used to work for Microsoft as a marketing executive, but he isn't betting on the floundering mobile OS for old times' sake. "Businesses have always used Windows applications, and Microsoft has made it much easier to write for Windows mobile devices," he says, adding that he and other TeamViewer execs carry Windows 10 Mobile phones. DocuSign, a provider of electronic-signature and digital transaction services, supports Windows 10 Mobile, along with the more popular iOS and Android platforms. "Our customers say they want choice of platform, and for the larger businesses that includes Windows Mobile," according to Brad Brooks, DocuSign's CMO. Brooks says the number of DocuSign customers who use Windows 10 Mobile is relatively small, but the cost of maintaining Windows code is low enough for it to make economic sense for the company to support it. DocuSign was also so impressed with Windows 10 Mobile's implementation of digital ink that the company decided to use it to demo its own products. Microsoft is well aware of its market share problem and the related shortage of quality mobile apps, of course, and it purchased Xamarin in February to make it simpler, and thus cheaper, for Windows developers to port their desktop applications to iOS, Android or Windows 10 Mobile. "This is not for people who write iOS or Android apps, but if you are a corporate Windows developer and you have held back on mobile applications, now you have the possibility of building your applications for third party mobile platforms," according to Wes Miller, an analyst at Directions on Microsoft, who spoke with CIO.com last month. Windows no longer rules the business software world unchallenged, but a huge install base of Microsoft applications still exists within in midsize and large businesses. "Eighty percent of the applications my customers want to run are Windows, and they want them on mobile devices," says Keith Groom, director of Microsoft solutions at Softchoice, an IT services company. In the past, mobile apps for Windows weren't exactly impressive, Groom says, but he expects that to change. "I think developers will step up. That's Microsoft's challenge." Microsoft has been losing mobile market share steadily for three years, according to Gartner analyst Tuong Huy Nguyen, down from 3.2 percent in 2013 to just 1.9 percent of the market at the end of 2015. "Businesses are saying BYOD, and in this environment 'your own' does not mean Windows," he says. Even IT executives who say they're impressed with the innovations Microsoft brought to Windows Mobile believe the lack of consumer interest in Windows smartphones and tablets will be difficult to overcome. "[Windows Mobile] management and security are excellent," says Anurag Gupta, a managing director at CDI, a $1 billion IT services company based in Philadelphia. "There is an advantage to having things working seamlessly across platforms." 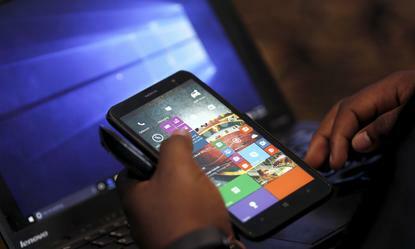 However, Gupta doesn't expect many business users to adopt Windows phones on their own. "Go to any gathering, and no CXO will be caught with a Windows phone," he says. This dearth of Windows phones creates a classic chicken-and-egg dilemma for Microsoft and developers who seeks large pools of potential customers. "Adoption in the consumer market is inextricably linked to greater adoption in the enterprise market, because employees want to use the same devices at work that they have chosen for personal use," wrote Gartner analyst Ken Dulaney last fall in a research report. Windows 10 Mobile partisans argue that the trend could be reversed. Carl Mazzanti, CEO of eMazzanti, an IT services company in New York, says Windows phones are significantly cheaper than the popular iOS and Android devices, about $150 each, or roughly 25 percent of the cost of Apple or Samsung smartphones. "That's a selling point for some of my clients," he says. However, Dulaney believes a comeback is unlikely. "If we look at historical platforms, such as Symbian, BlackBerry and Palm OS, once they fell below 5 percent worldwide share, there was little chance they would re-emerge as successful because the alternatives were so well established." DocuSign's Brooks cites a different slice of technology history. "When Apple launched the iPhone there were just three apps," he says. "When Google was going to launch a branded version of Linux (which became Android) people laughed. There's the long game and there's the short game." Nevertheless, Brooks doesn't plan to leave his chips on the table indefinitely. "If that 1.5 or 2.5 percent [market share] doesn't translate to 5 or 10 percent down the road, and if costs don't continue to decline, we'll have to ask if Windows Mobile makes sense."